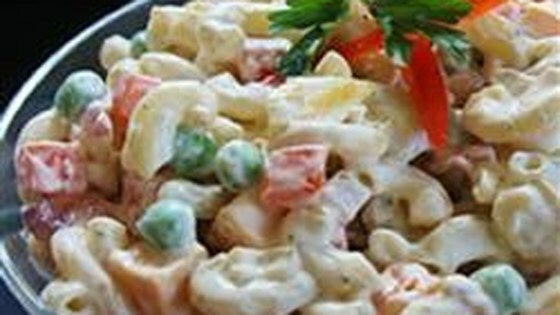 "Macaroni salad can sometimes be a little boring. So one day I just started adding extra ingredients and this is what I came up with. The whole family love's it! This recipe is even better if served the next day so that all of the flavors are well-incorporated. Enjoy!" Cook bacon in a large, deep skillet over medium-high heat until crisp, about 10 minutes; drain on a plate lined with paper towels until cool. Crumble the bacon. Bring a large pot of lightly salted water to a boil. Cook elbow macaroni in the boiling water, stirring occasionally, until cooked through but firm to the bite, 8 minutes; drain. Rinse macaroni with cold water until cool; drain. Mix cooled macaroni, crumbled bacon, mayonnaise, red onion, green bell pepper, ranch salad dressing mix, and Cheddar cheese together in a large bowl. Cover the bowl with plastic wrap and refrigerate at least 4 hours before serving. Cheddar, bacon, and ranch dressing make a fast and flavorful pasta salad. This was right up our alley. I did mix mayo with sour cream as another reviewer recommended. Great ranch flavor and super quick to prepare. Highly recommend! This recipe is really good. Added more of the ranch mixture. Try heating up. It's excellent. Actually better hot. this recipe was a nice alternative to classic mac salad. I just had to substitute some sour cream because I ran out of mayo, but it was just fine that way. yum!